This fall, Northern Virginia’s Loudoun County Public Schools will introduce a new personalized learning approach in 15 elementary and secondary schools, adding a powerful strategy to the district’s overall vision of preparing students for an increasingly competitive, but collaborative world. Moving deliberatively – and quickly – to bring personalized learning to the large district may prove to be a key strategy in moving Loudoun to deeper, more relevant learning. Details follow. Is personalized learning needed in a large, successful, suburban school district? To some, leading Loudoun County Public Schools might seem like an ideal situation to maintain the status quo, to not rock the boat. Loudoun County, located in bucolic northern Virginia just outside Washington, DC, has been consistently ranked as one of the wealthiest counties in the nation. The biggest challenge facing Loudoun County schools would appear to be the explosive population growth in the county, which has doubled since 2000. The school system has been building multiple schools every year to keep pace. But for two innovative educational leaders who came to Loudoun in the last two years, just maintaining consistently good academic performance and coping with growth was not enough. Dr. Eric Williams, who became superintendent of Loudoun County Public Schools (LCPS) in 2014, and Cindy Ambrose, the new Assistant Superintendent for Instruction, realized they had an even more difficult challenge than growth: how to deepen and enrich student learning beyond producing strong summative assessment results. To be sure, sustaining academic quality in a rapidly growing, 75,000-plus student school district is no easy feat. A great deal of effort and innovation goes into continuing to meet the lofty expectations of Loudoun parents, who have grown used to the district’s consistent 80-90% proficiency rates on Virginia’s Standards of Learning exams. Though achievement gaps remain, LCPS consistently ranks near the top of all Virginia districts on traditional measures of school performance. It is rare for a district’s board to be unsatisfied with such a successful status quo, but they wanted more for Loudoun students, which is why they brought in Williams, who then found Ambrose. the system needed to be focused on personalizing learning for students to truly own their learning in order to prepare them for the future. Williams and Ambrose agree, as do the school board and an increasing number of teachers, students and parents, that something more was needed, or Loudoun would not sustain its strong results and continue to graduate educationally or vocationally prepared students. “When I ask students, parents, educators what they want from a graduate, the first answer isn’t about memorized facts, but that they can think and solve problems, that they can communicate and contribute,” said Dr. Williams on public radio’s Kojo Nnamdi show last year. He and the school board developed a strategic plan, which has as a first goal producing this type of graduate by using the One to the World framework, project-based learning, and personalized learning. The four elements of OttW learning experiences provide an instructional framework to support the district’s mission of empowering all students to make meaningful contributions to the world through solving authentic, challenging problems, create public products, and connect with the world to make meaningful contributions. By connecting students globally, OttW will foster student mastery of the content and competencies of the curriculum. It is an instructional approach that leverages technology with a clear vision for how it can support teaching and learning. Virtual Instruction Student Innovative Organizational Network (VISION) is an in-house repository of courses, online resources and interactive curriculum (LCPS’s own digital learning management system) that also hosts Virtual Loudoun, which offers online courses to secondary students. Loudoun Creates is a systematic effort to move students from consumers to creators of digital content. Student digital content is published and publicly available through a video channel. No transformative change would be possible, of course, without Loudoun’s educators embracing change and being supported through it. To do this, LCPS is creating cross-functional teams to work through the change together, designing key processes of implementation and support, and harnessing the collective wisdom of the organization to iterate, while setting high standards and continuously improving. Discontinuities can create opportunities that become the catalyst for incremental innovation, driving the need for change. One of the most successful and recent examples of incremental innovation may be the iPhone. While “smartphones” already existed, it was the incremental innovations of a larger touchscreen, the app store, an improved overall experience, and other enhancements that helped enabled the iPhone to be the first in making smartphones mainstream. In many ways, this is analogous to the introduction of personalized learning in Loudoun. To launch Horry County’s adoption of its personalized learning model, Ambrose brought in Education Elements, a national leader in designing and implementing personalized learning programs. They started with readiness assessments of school leadership teams, then evaluated the schools’ infrastructure, teacher collaboration, and other elements important to the success of Horry’s initiative. In Loudoun, Williams and Ambrose are engaging Education Elements to support the phased implementation to personalized learning, a transition the firm has led in the Middletown, NY public schools along with many of the nation’s other, most successful personalized learning school districts. 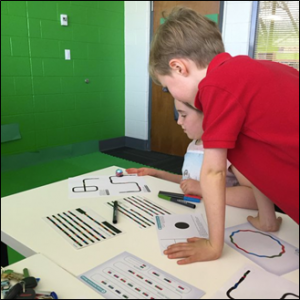 In partnership with Education Elements, Loudoun recently completed an application process whereby schools answered comprehensive questions about why they wanted to participate in personalized learning. The application addressed the capacity and role of school leadership and staff to implement personalized learning, how personalized learning fits into the district’s and school’s existing initiatives, any experience the school already had with personalized and blended learning, and how personalized learning could help the school meets its unique challenges and opportunities. As a result of this thorough process, Loudoun selected 15 schools – 10 elementary, 5 middle – to start personalized blended learning in the fall of 2016. In addition, two high schools were selected to begin readiness work for a personalized learning launch in the Fall of 2017. This opt-in, phased approach creates demand and ownership – critical elements in a district that is undergoing change but in which not all may believe they need to change. Loudoun will use what Williams calls a “‘student driver’ approach, where students are behind the wheel of using digital tools as part of their learning, but with guidance and direction from teachers on appropriate and effective use of those tools.” This crucial insight is one that has driven the leaders of LCPS to approach this transition with a broad field of vision of invigorating their instructional program. integration (methods and processes throughout the organization). Within this framework, LCPS is implementing a professional learning approach to support capacity building and continuous improvement for its educators. Next, the district is looking at how its existing Technology Resource Teachers can support personalized learning, as well as reconfiguring district staffing to move resources closer to teachers by bringing more reading and math instructional coaches into schools. These efforts – systems thinking and resource reallocation – will be essential in supporting teachers in the transition to personalized learning. Education Elements will also assist Loudoun in selecting supplemental digital content and tools, as well as leading robust and sustained professional development to support leader and teacher success with personalized learning. This support starts with multiple days of foundational and design workshops, readiness assessments, and trainings. It continues over the course of the launch year to support and refine implementation both virtually and in-person. Loudoun also aims to be more effective with data to drive personalized learning. 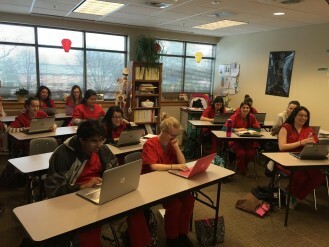 Although the district is starting to use data to identify intervention needs through its own home-grown system, Loudoun will look to develop its use of dashboards and meaningful, real-time data through well-articulated differentiation and intervention, adaptive digital content, and in the design, delivery, and iteration its project-based learning approach through One to the World. Of particular note is that this initiative is being paid for out of existing budget line items; creative budgeting and efficient use of resources is necessary as the district moves to expand full-day kindergarten and cope with the continued capital costs driven by growth. This is a critically important factor for other districts looking to go personalized: it can be done with smart and strategic resource reallocations rather than requiring significant new investment. Loudoun’s OttW strategy employs project-based learning as one powerful means of engaging students. Another means is the coming introduction of personalized learning that leverages technology to enable students to master significant content via small group instruction with the teacher, as well as adaptive digital content that personalizes the instruction to meet individual student needs. The pedagogical hierarchy progresses from using digital content to provide the basic level of understanding and retention of knowledge, to teacher-directed application and analysis of content, to group and project-based learning to evaluate and create. In this way, full spectrum teaching and learning is addressed in a coherent and seamless way, while incorporating effective differentiation to address students falling behind or ready to move forward more quickly. One to the World will integrate technology to connect students with valuable tools and information, with others with whom they collaborate, and with audiences beyond the teacher. The district will continue to purchase devices for student use. This will include a combination of desktop computers, laptops,and tablets. The district currently has an average ratio of one device for every three and a half students, and also plans to implement a Bring-Your-Own-Technology (BYOT) initiative, allowing students at participating schools to bring personally owned electronic devices to school for learning. Loudoun’s philosophy is that learning increases when students become content producers and share their understanding with the world. They must sort, classify, and organize content to find the best way to “teach” it to others. It is anticipated that this will lead to increased student motivation as they are given a voice and are asked to reach an audience beyond the classroom. Finally, Williams questions the need for rigid grade level expectations. When it comes to innovation, he advocates for more than just digital technology, personalized learning, and real-world experiences. Williams wants to provide students with increased depth of learning, rather than being satisfied with students meeting grade level expectations. In short, being “on grade level” will be the beginning, not the end, of expectations and learning for students in Loudoun. Transitioning to a personalized learning model, whether at a single school or districtwide, is a significant undertaking which requires sustained commitment. If the experiences of personalized learning leaders around the country in making such transitions offer any guidance, Loudon’s decision to focus initially on 1/6th of its schools (15 schools in the 2016-17 school year), is grounded soundly. Executing this ambitious plan successfully holds much promise for Loudoun’s position as an education leader for Virginia and for the mid-Atlantic region. Stewarded by the vision and leadership of Dr. Williams, the experience of Ms. Ambrose, and the support of teachers, parents, students and the school board, it can be reasonably expected that this initial implementation will successfully grow over time, making LCPS one of the largest districts to fully implement personalized learning. This entry was posted in Education, Personalized Learning Case Studies and tagged Blended Learning, Personalized Learning. Bookmark the permalink.